The speculation about the future of Australia's Prime Minister Tony Abbott continues. He is a victim of negative momentum and his own leadership and management and lack thereof. The same is true for you and me. Your leadership and management are driving your momentum (positive and negative). 21st management is all about PPPPSs (policies, procedures, practices, processes and systems). Do your PPPPS's make it simple for people to bring their best to their work? Your truthful answer to this question has profound consequences. I define management as the practice of making it simple for people to bring everything remarkable that they are to everything they do. 21st leadership is all about people. A key question real leaders must ask and answer with action is: How are my leadership and management adapting and growing in this mobile centric, technology driven world? Today and for the future effective leadership is all about mobility which of course is a key to positive momentum. And management must be in sync or everything grinds to a halt. Leadership is about feelings, emotions, matters of the heart. Leadership is a verb. Leadership is about moving people. I define leadership as the art of inspiring people to bring everything remarkable that they are (that one-of-a-kind that each of us is) to everything they do. Leadership falters, and usually very badly without management. How 21st century are your leadership and management? Your truthful answer to this question is a clear indication of whether you're riding the wave of positive momentum or struggling to breathe in the torrent that is negative momentum. 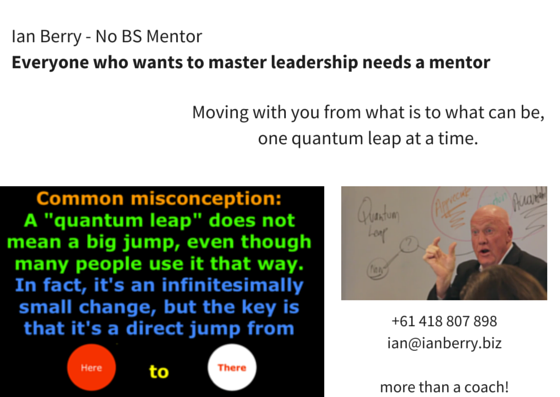 And remember this: leadership increases momentum and management maintains it.